I do not like my current collision system. When dynamic stuff interacts, everything just stops dead in their tracks. I expect the player to bump into a lot of things — enemies, chests, walls, etc. But it doesn’t feel good and that’s a big no-no for a game like this that is supposed to be gameplay-centric. I mean, the system has to be pretty much “perfect” to feel good. And the current wall checking logic is somewhat horrible too. I guess, in hindsight, I should not have done it the way I did. Oh well. If I did collide, that tile would want to push the player back into the bottom tile and then even more to the right. Not only do the calculations become a mess, but the whole thing spazzes out even worse. In short, there’s a lot of ways to make it go haywire and only a few very specific solutions that don’t conflict. First, I let every entity move as it wants to. The player can follow player’s input, enemies can follow paths, projectiles can fly, etc. There aren’t any restrictions here, but the movement used proper acceleration and deceleration as applicable to what they are doing. 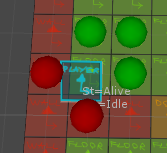 This is what makes the player move smoothly. Then I collide every entity with every other entity. 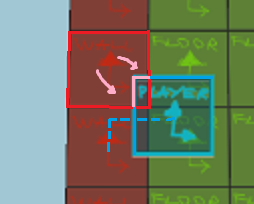 Two entities can be overlapping because one or both moved into the other’s space or because last frame they were forced to. If they overlap, then I push the apart by storing a “force” for the next step. Next, every entity is forced to move according to all the forces that were applied to it. Currently, the only forces are from overlapping two or more entities. In the future, this can be other things that make the entities move, like sliding floor or wind or whatever. 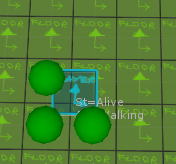 So this step “separates” the entities from one another. Finally, I check that the entities don’t collide with tiles. If they do, I move them away. There are no forces or speeds here — they get literally teleported out of the walls without compromise. 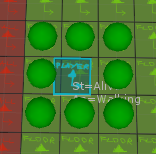 This can result in entities overlapping after this, but that’s allowed. While moving into walls and warping through or something is definitely not allowed. This approach lets me control exactly what happens to entity movement. Actual movement and force from collision do not interfere. The tiles always take precedence. These are basically circle collisions — straight distances between the entities. When they are closer than the sum of their collision distance, then they both get pushed away from each other by that amount (step 2). If they happen to be moving as well, that’s an extra movement (step 1). The result is as above. The player can bump into and move enemies around. The player can squeeze between diagonally placed chests, but not two chests next to each other. Of course, all entities have their collision sizes, so the actual distance/interaction depends on that. Now, doing all of this I broke the actual detection of who hits what, like projectiles hitting enemies. I also managed to inadvertently add stuff like projectiles pushing the enemies as they touch. So that’s another thing I’m fixing and adjusting. At least I know what the problem is and how to solve it. Essentially, I can never move things more than the smallest collider size that I have. In other words, if projectiles are 0.1 units wide, then they can move at most in 0.1 units steps or they can pass through things. Breaking movement into steps is much less efficient, but I have to do it if I don’t want things noclipping. Mobs may need some 2-3 steps per frame, while fast projectiles could go to 7-10. From the four tasks I mentioned above, both 1 and 3 now do these stepped movements. I can further optimize performance a bunch, like cache various queries and requests and such. I’ve already taken steps to make it all run smoothly. So this shouldn’t be too bad, even with dozens if a hundred moving objects. And this works great now. In fact, pretty much all collisions work great now. Looking back at the start of this, I can’t imagine how I could live with the old collisions. And I can’t imagine how I would force Unity physics to do some of the stuff that I want to do (I could get may be 80% there but last 20% would be nigh-impossible). This is really important if I ever want to do unexpected things to AIs, like push them around, have explosions scatter them, etc. And things like enemy swarms can navigate much better if they don’t have to do complicated crowd avoidance. I can make small enemies and large enemies and it doesn’t matter that they don’t fit exactly in grid squares or know how to avoid each other perfectly. 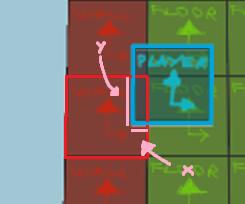 Final small issue is that, occasionally, the player experiences abrupt movement changes, such as when running into walls. So I will be making my camera follow them smoothly, so that there are never any jarring changes like this. But that’s for later.